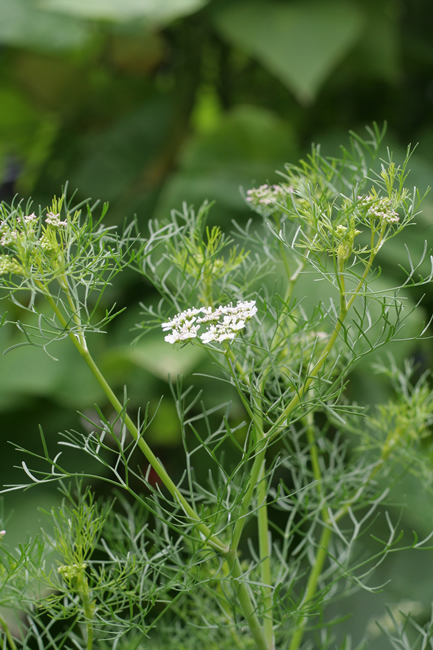 At this time of year articles begin to proliferate describing plants you can grow that will lend splashes of colour to sombre autumn and winter days. 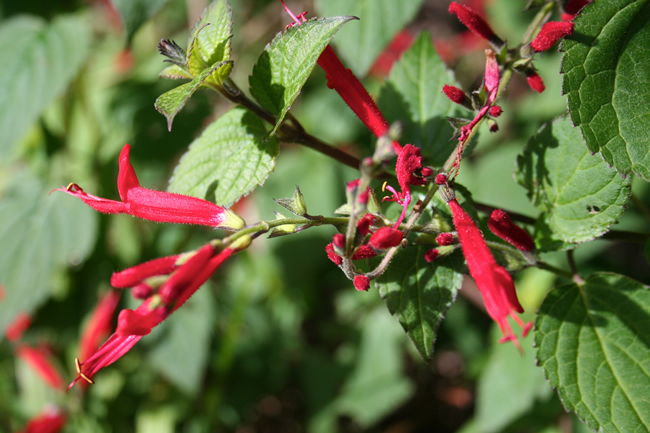 As usual I am gaining much pleasure from the bright red flowers of pineapple sage (Salvia elegans). So too are the eastern spinebills who flash their tawny throats at me as they fossick for nectar. Also dog’s bane (so named because it’s ability to repel some dogs), Plectranthus ornatus, has been sporting its strong, mauve flowers for months now and will continue to do so right through winter. Really for me the colour highlights in late autumn and winter come from all the plants I haven’t planted, the ones that turn up whether you want them or not. The lovely autumn days entice me into the garden where I have been madly weeding and cutting back the prolific summer growth. I love this time of year when the soil is still warm, so plants are still growing, but the intense heat has gone. 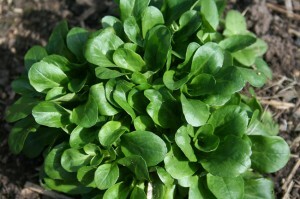 Two plants that come into their own now are corn salad and landcress. These are both annuals (landcress is sometimes biennial) that self sow around my garden providing salad greens right though autumn and winter. This mook (a cross between a magazine and a book) is the second in the series produced by Organic Gardener Magazine. It is made up of articles by well-known garden writers from across Australia. Some articles have been previously published by Organic Gardener, others are written specifically for this mook. There is everything from pruning (an article I keep going back to, to check how it should be done) by Peter Cundall to pest control by Jerry Coleby-Williams and planning the orchard by Phil Dudman. It also looks at harvesting and storing the produce. The fruits covered include apples, avocado, bananas, berries, citrus, grapes, mangoes, melons, nuts, olives, passionfruit, stone fruit and strawberries. Comprehensive and cheap at only $10. Rising costs have combined with anxiety about food security to create a critical moment for people considering growing their own food. Right on cue is “Vegies A-Z”. It’s the third OG special (after Getting Started, $10.00, and Fruit, $10.00). Vegies A-Z combines new material with recent OG articles from reliable writers. My quibble with this third volume is that there is not more on soil preparation, which is crucial. Perhaps that’s in Getting Started? Perhaps the three volumes need to be read seriatum, and would make a great gift, possibly to yourself. PW is a major contributor. — AMS.